Nikola Vaptsarov Vocational School was founded in 1925. We are proud to say that it is the first school to teach electrical engineering in our country. 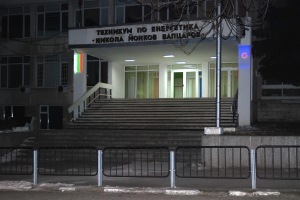 During its long history the school has given profession to more than 7 thousand specialists for home power engineering. The tradition generated and stored over the years and the look to the future are the basis of its activities. 261 highly motivated young people are trained in day-time training and 50 in private form of education. The school has spacious classrooms, updated with new tables, chairs and white boards, three computer labs, 2 gymnasiums and a multipurpose sports playground, rich school library with over 10 000 volumes. There are several clubs in our school: Historian, Theatre Club, Literature and Word and Internet Safety Club. In December 2010 we celebrated 100 anniversary of the patron and 85 anniversary of the foundation of our school. At the celebration, dedicated to 100 anniversary of our patron, the youngest students in our school presented the play Christmas present.